Rotavirus vaccine supplied under UIP has 10 doses per vial. The vaccine is generally a pink liquid but may sometimes change to orange or light yellow in colour. This change in colour does not impact the quality of the vaccine. 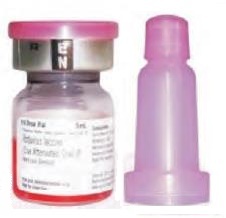 The vaccine is supplied with a pink coloured dropper that is longer and wider than the dropper used for OPV. For programmatic reasons, the Government of India recommends vaccination upto a maximum of one year of age for BCG, Pentavalent, IPV and Rotavirus. Does the breastfeeding need to be withheld for some time before or after vaccination? Is any other RVV also available in India? 1. Rotavac®, a monovalent live vaccine manufactured by Bharat Biotech. This is presently used under UIP and given in 3 doses at ages 6 weeks, 10 weeks and 14 weeks. 2. Rotarix®, a monovalent live vaccine, manufactured by GlaxoSmithKline Biologicals. It is given in 2 doses at ages 2 months and 4 months. 3. RotaTeq®, a Pentavalent live vaccine manufactured by Merck and Co. It is given in 3 doses at 2, 4 and 6 months of age. As the composition of the available Rotavirus vaccines and dosage guidelines are different, Rotavirus vaccine from SAME manufacturer is to be used to complete the immunization schedule of an infant. 1. Known or documented allergic reaction to the vaccine. However, if the infant has minor illnesses, such as low grade fever and upper respiratory infections (URI), the vaccine can be given. Is a booster dose recommended? •	Rotavirus Vaccine largely provides protection for at least first 2 years of life, when the risk of rotavirus diarrhea is highest. •	Also, current scientific evidence suggests that by the second year, most children are exposed to rotavirus and develop protective antibody. The Rotavirus Vaccine should be stored at -20°C, in the walk-in freezers (WIFs) or deep freezers (DFs). RVV should be stored at +2°C to +8°C, in ice-lined refrigerators (ILRs). In the ILR, Rotavirus vaccine should be stored at or above BCG level. Should the droppers also be stored along with the vaccine? NO, the droppers for administration of the vaccine are to be stored at room temperature as freezing can cause the droppers to crack. The droppers are to be stored and carried along with the other dry supplies (e.g. syringes) outside the vaccine carrier. Where the Rotavirus vaccine should be kept at the immunization session? Is the vaccine eligible for ‘Open Vial Policy’? Therefore the date and time of opening a rotavirus vaccine vial must be recorded on the vial. What is the maximum age limit for giving the first dose of Rotavirus vaccine? Under UIP, the upper age limit for giving the first dose of Rotavirus vaccine is one year of age. However, if the child has received first dose of Rotavirus vaccine by 12 months of age, the course should be completed by giving two more doses at an interval of 4 weeks. What If the child spits out the Rotavirus vaccine or vomits immediately after having it? To prevent spitting, the drops are put towards the inner cheek. Avoid putting the drops over the tongue. What are the common side-effects of Rotavirus vaccine? The available Rotavirus Vaccines are observed to be effective in preventing SEVERE rotavirus diarrhea by 54-60%. There is also some evidence that Rotavirus vaccination leads to herd protection in unvaccinated older children and adults. A rare adverse event of ‘intussusception’ has been reported after Rotavirus vaccine. The risk of intussusception is about 1–2/100,000 infants vaccinated and occurs shortly after the first dose. Why is RVV included in the NIS despite medium efficacy and a small risk of intussusception? •	Available evidence suggests that rotavirus vaccines are most effective at preventing the severe and life-threatening cases of rotavirus diarrhea. •	Intussusception can occur in children even without rotavirus vaccine. •	Rotavirus vaccine is already being used in national immunization program of 80 countries. The risk of adverse events after rotavirus vaccination is much lower than the risk of severe rotavirus disease in unvaccinated children. Hence, rotavirus vaccine is recommended to prevent rotavirus disease in infants and young children. Will vaccination with Rotavirus vaccine prevent all diarrheas? No, it does not prevent all diarrheas. Diarrhea is caused by many organisms, of which Rotavirus is one of the leading causes in children. Rotavirus vaccine is effective in preventing diarrhea due to Rotavirus only. So the child may still get diarrhea due to other infectious and non-infectious causes even after receiving Rotavirus vaccine. Why was the need felt to introduce Rotavirus vaccine into the NIS? •	The incidence of rotavirus infection is similar in both developed and developing countries. However, more than 80% of rotavirus deaths occur in developing countries, where poverty, malnutrition and limited access to health services exacerbate the problem. •	It has been observed that rotavirus infects Indian children at an age younger than the children in developed countries. The exposure is still earlier among children in the poorest, rural households with the highest risk of mortality. Therefore, WHO has recommended inclusion of Rotavirus Vaccines in national immunization programmes of all countries, particularly in South and South-Eastern Asia. Enumerate other interventions for reducing under- five deaths due to diarrhea. What should be done if a child has received one or two doses of Rotavirus vaccine in private facility? Verify the brand name of the Rotavirus vaccine given on the immunization card. If not written, ask the parents to check with the doctor about the name of the Rotavirus vaccine. UIP, then the child should be given a new course of all 3 doses of Rotavirus vaccine under UIP, at interval of 4 weeks between doses. 3. If the parents are not sure about the name of Rotavirus vaccine given in private facility, start a new course with all three doses of Rotavirus vaccine at an interval of 4 weeks.